Dressing your dog up in pet jackets or sweaters is generally a good idea. Of course, it also depends on the breed of dog. If you have a chihuahua, a french bulldog or some other breed that lacks a lot of fur, getting them a sweater is a great way to protect them from the winter chill. Naturally, if you have a dog that is built for the cold, they already will have natural insulation with the extra amount of fur they possess. In this case, if you give them a sweater or jacket, it may (believe it or not) lead to overheating even in the cold weather. This can actually be every bit as bad as a dog that is freezing. Keep an eye on their paws to see if there's snow stuck in between their beans and check if their ears and nose aren't cold. Moisturizing the paws of your dog can help prevent your furry friend from having cracking, cuts, and peeling. These afflictions can be very painful for your dog’s paws and can lead to raw or bleeding skin, and your pet can incur infections later on. Considering if your dogs will be more susceptible to frostbite if their paws are exposed. That is the bad news. The good news is that moisturizing creams and salves help your dog immensely in harshly cold climates. One thing you certainly want to avoid would be using human lotion on the paws, simply because it can irritate your dog’s paws and cause them to soften too much and only create additional problems. If you have a dog with paws that are constantly cracking or bleeding, then proper hydration is a must. With water hydrating through their system, their paws will not be as dry. When they are not as dry, they will not be as vulnerable to the cold, and yet again they will be less likely to develop frostbite on their paws or nose. So keep their water bowl with fresh water and placed somewhere safe from cold. Another thing you could do to protect dog skin would be to simply keep the dog inside the house. Of course, like everything else, there are some pros and cons with this strategy. 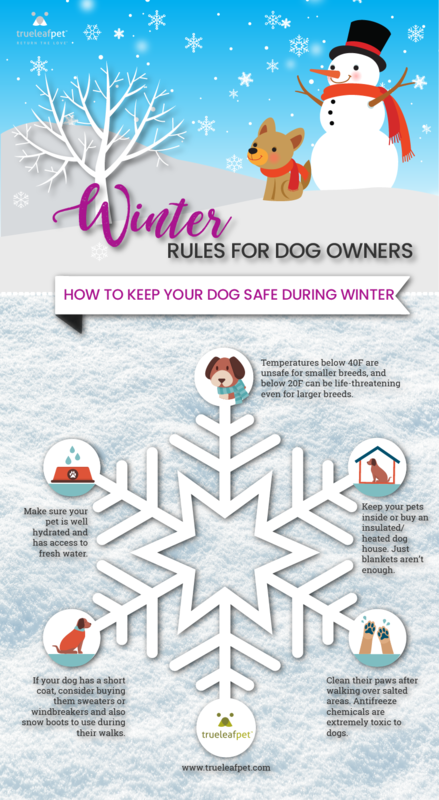 For one thing, there are some questions you have to ask yourself when it comes to protecting your dog in winter in this manner. First of all, is your dog well-behaved? You naturally cannot employ this strategy that well if your dog is destructive for any reason. Secondly, do the human inhabitants of your home have any allergies that will be aggravated if the dog is inside? If anyone in your home is allergic to pet hair, this might not be the best strategy. You also will need to ensure the dog is adequately trained and that you and your family will be committed to taking the dog out for their bathroom habits. If there are issues bringing the dog inside the house to stay with your family, consider using a spare room for your pet, or buying an insulated or heated dog house. These are all good strategies for helping your dog in winter. Employing them will ensure that you treat your dog the way you would want to be treated, and return the love they give you.